Freelance writer and photographer who has contributed to UKTV, Expedia, Hotels.com and USA Today and lives in West London. The Golborne Deli is set on increasingly fashionable Golborne Road, Notting Hill's northernmost outpost. The street still has the feel of Notting Hill 25 years ago, before the Notting Hill movie which launched an onslaught of bankers, and a tsunami of top-end restaurants and astonishingly expensive clothes shops. Golborne Road is at the north end of Portobello Road, and many visitors to the famous Portobello Market don't make it past the flyover which bisects Portobello Road just by Cambridge Gardens. They're making a big mistake, because just five minutes' walk further on and you'll come to Golborne Road, with its boho independent shops, selling everything from vintage and retro furniture to delicious Portuguese pastries and genuine Moroccan goods. 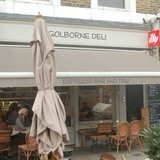 Golborne Deli at 100 Golborne Road, a neighbourhood cafe and deli that's open for breakfast and lunch, has been a favourite of locals since 2002. Current owners, George and Alex, took over a couple of years ago. They took full advantage of the funky second hand furniture shops and stalls on the street and transformed the venue into a laid-back and stylish venue that exemplifies what you might call Golborne/Portobello chic. We went for lunch on a Saturday, when the Golborne street market is at its busiest and were glad to get out of the rain into the friendly atmosphere of the Deli. There are pavement seats and parasols for days when the weather is kind, creating an ideal spot for watching Golborne's colourful street life. Food at the deli is very much Mediterranean, with many ingredients sourced directly from Sicily. I chose Chicken Avocado Salad which came with ciabatta, mixed leaves, red peppers, French dressing and shaved parmesan. Ingredients were fresh and the Parmesan set off the other flavours perfectly. My partner went for a bruschetta with prosciutto, buffalo mozzarella and tomatoes, a beautiful combination of Mediterranean treats. The Golborne Deli also does fantastic breakfasts, including the Deli Breakfast, scrambled eggs, crispy pancetta and toasted ciabatta. They also take their coffee very seriously, with a whole section of their website devoted to their coffee philosophy. I can vouch for the fact that my double espresso scored top marks.